Ok, I am not a very big fan of vegetables...is there like a way I can get the nutrition in a different way? And also...diabetes runs on both sides of my family and growing up I ate a lot of sugar and sweets. Besides blood testing is there a way to help prevent the onset of diabetes? Sorry if my questions are sort of random but thanks for the help. 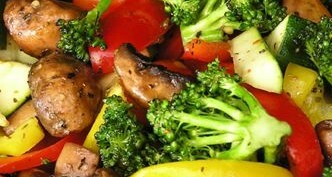 Start with the veggies you like, even if it means eating the same veggie every day. Have large portions of the ones you like: If you are limited to liking only asparagus, eat a 1 1/2 cup portion...that's 3 servings even though it's a single veggie! Sneak it in: Puree vegetables and add them to foods (especially sauces and soups). Ex: Add pureed carrots or sweet potatoes to tomato sauce. Sneaking spinach into brownies is another one of my favorites! Grate or chop a vegetable into tiny, almost undetectable bits. Carrots, for example, look like flecks of cheese this way and can be sprinkled on pasta. Spice it up. Strong flavors like garlic and ginger help distract the taste buds! The Sneaky Chef by Missy Chase Lapine and Stealth Health by Evelyn Tribole, M.S., R.D. One of the best ways to prevent the onset is to maintain a healthy body weight. Excess weight can cause cells to become RESISTANT to insulin. Regular exercise helps too! Not only does exercising help manage your weight, it helps your cells become more SENSITIVE to insulin. I'd also suggest eating small, frequent meals that all contain small amounts of protein and slow digesting carbohydrates (also called "low glycemic" carbohydrates).